Truffle burgers with truffle grills. 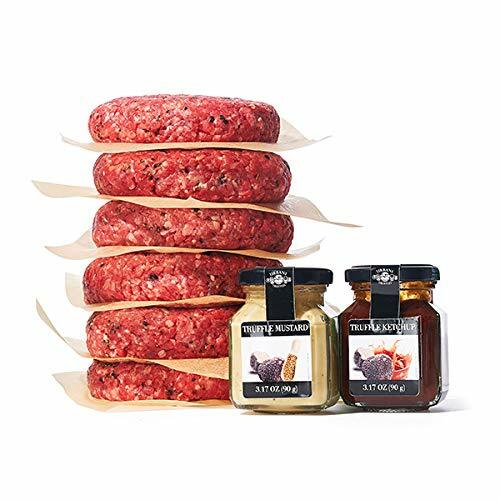 IN THE KIT: 6 BURGERS, 8oz EACH + 1 URBANI TRUFFLE KETCHUP 3.17oz + 1 URBANI TRUFFLE MUSTARD 3.17oz TRUFFLE BURGERS MADE IN PARTNERSHIP WITH PAT LAFRIEDA ACCOMPAINED WITH OUR FAMOUS GRILLS CONDIMENTS: TRUFFLE KETCHUP AND TRUFFLE MUSTARD. OUR TRUFFLE BURGER IS MADE FROM FAMOUS PAT LAFRIEDA SHORT RIB, BRISKET, CHUCK, AND BLENDED WITH 100% ITALIAN URBANI BLACK SUMMER TRUFFLES. OUR TRUFFLE BURGERS ARE MADE FRESH DAILY FROM WHOLE CUTS OF MEAT, NOT TRIMMINGS: YOU WILL TASTE THE DIFFERENCE IN EVERY JUICY AND DELICIOUS BITE.